San Francisco is the hilliest (funny title, right?) city in the United States. Oddly enough, I grew up next to what is often referred to as the second hilliest place in the US – Fitchburg, MA. 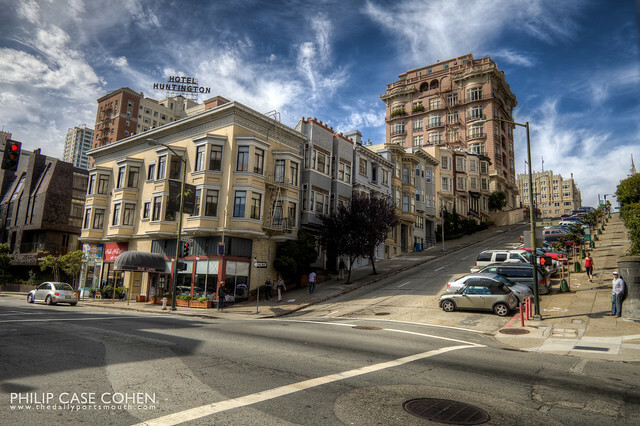 But nevermind that for now – the shot above captures a typical streetscape in San Fran – ridiculous slopes and cars parked at angles so steep that you can barely believe they don’t roll right over. This isn’t really quite a case of that, but walking up the hills over and over again will definitely give you some sore legs, and make for fun driving. Below is an architectural detail that typifies what you might see on any random street in the city. Richly detailed masonry and fire escapes adorning the sides of a building. 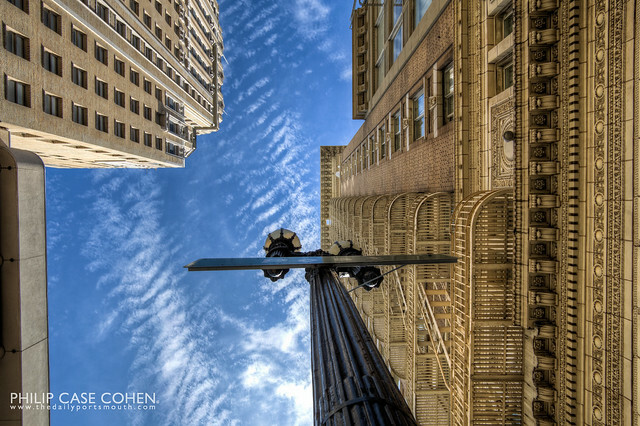 The blue sky and the clouds caught my eye, and the symmetry and the patterns of the buildings made for a great detail shot. Great shot Phil! Really like everything about that Hotel Huntington image. Love them both Phil, but the top one is great. San Fran is so beautiful! I feel like I’m in the movie inception (lower photo). Phil, as always your photos are wonderful, thanks for sharing!